Chip Kelly: Tony Romo is "Elite," Has Been "For a Long Time"
Don’t bring the debate over whether Tony Romo is “elite” or not around Philadelphia Eagles coach Chip Kelly. Kelly said in a conference call this week, ahead of his team’s first meeting with the Cowboys of the year, that not only does he see Romo as elite, he believes he’s been elite for a good, long while now. 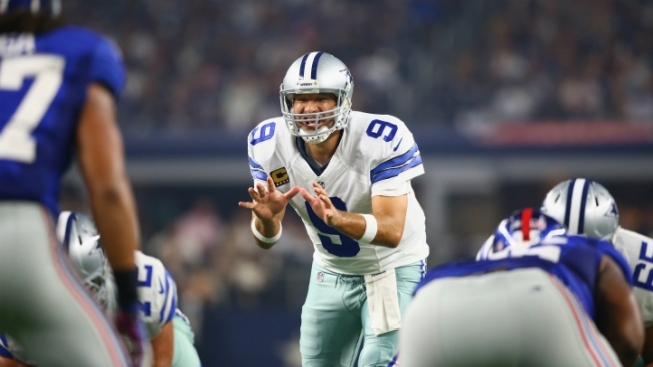 "Tony has been an elite quarterback for a long time," Kelly said, via the Dallas Morning News. "He's as good as anybody playing right now. I've always been a big fan of Tony and just how he plays the game at quarterback. He has an unbelievable understanding of what they're doing. He gets them always into the right play, always in the right protection and he can make all the throws. He's playing as good as any quarterback in the National Football League." Kelly knows that Romo isn’t much of a threat to run but, aside from that--from where Kelly’s standing--he does about everything else well. "His understanding of the game, his understanding of exactly what everybody is doing, his ability to direct traffic, whether it be protections or check to runs or knowing exactly where the defense is vulnerable, depending on the defensive call, he seems like he always gets them in the right play," said Kelly. "And it really manifests itself at the end of games because he's just so strong with it, to go along with the skill set of being such an accurate quarterback. "He's outstanding in the pocket. Obviously I don't think he's a run threat, he's not Colin Kaepernick where he's going to pull it down and go, but you can't get to him because he's just so nifty about moving around and extending plays. That's a big, tall test for us this week, trying to corral him."